At first, the window didn't pop up at all--this is why I was confused. After reading your response, it occurred to me that my data broker display might be affecting it's behavior... Indeed it was! Might be worth noting that if folks are having trouble with configuring preferences, to have them check their data broker and display settings. When the block holding MyDurability was positioned at the bottom of my display, so the pop-up opened upwards, the text inside the pop-up was not visible, so was just an empty box. When that block was positioned at the top of my display, so the pop-up opens downwards, it worked as intended. 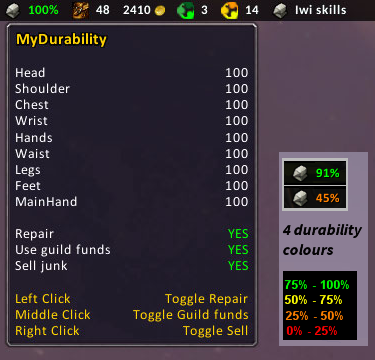 My issue was that I had the data block holding MyDurability configured to just display. When I changed the bar behavior and location of MyDurability, the pop up worked perfectly! Last edited by RosyBijou : 11-07-14 at 10:26 AM. Have really enjoyed your add-on. 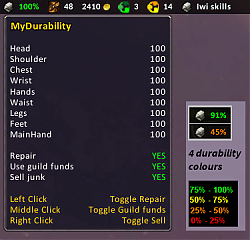 At the last update, I found that guild funds for repairs were automatically used for repairs. I can't seem to figure out how to opt out of this. I want to use my own funds for auto-repairs. Would you kindly post instructions on opting out of this? I definitely like the auto repair... I just don't want to tap into guild funds. You have to use the mouse buttons, pressing them on the durability text. For disabling the guild funding, press once the middle button over the databroker text (95% in the picture below), move away from the databroker itself and then move over again and you should have guild funds "NO" instead of "YES". The preferences are saved on account base. Last edited by gmarco : 11-05-14 at 01:49 PM.